A revision of the first project (which I blogged about last week) was due today at 9 am, and I’ll be honest: I didn’t have time to really think about a revision. Even if I had sorted through the contradictory advice I received, I just didn’t have time with everything else going on to do much of anything about it. So I took the lazy easy way out: I resubmitted my original draft without any changes. We’ll see what happens. In the meantime, I have four projects to evaluate before a week from today. I noticed they’ve added a column on the right side of the layout (see this image if you’re curious) with “Upcoming Deadlines,” I suppose because the site is kind of confusing as it is. I’m not quite sure this helps clarify things though. 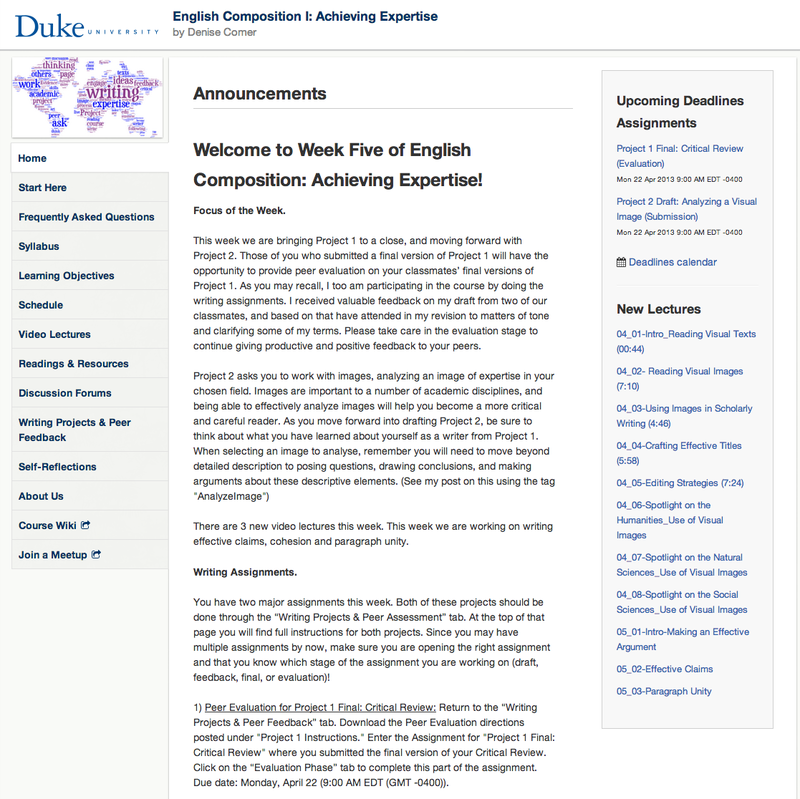 Week four is about “Reading Visual Texts,” and it includes the introduction of an assignment where we are supposed to write an “Analysis of a Visual Image Depicting Expertise” (that link is a PDF of the assignment). I think it is an ambitious and somewhat confusing assignment. It is continuing the premise of the first reading about expertise, but the idea of analyzing an image that depicts expertise is a bit of a disconnect for me. We’ll see how it goes. It also looks like part of the goal is to build into the assignment some more reflection from the peer review process, which means I am guessing that will be a part of the peer review for this assignment. Oh, and that’s due next week, the same day as my peer evaluation on the first assignment. Damn, this stuff is stacking up! The way that Denise talked about this picture was pretty smart. She introduced a few basic bits of vocabulary for “reading” visuals, then she asked us to stop for two minutes “just looking” at the image, and then (after a pause in the video) asks us to spend five minutes noticing things “you notice in the image.” Again, another perfect example of the kind of thing that works well in a face to face class and in a small group, but that doesn’t work so well in this context. 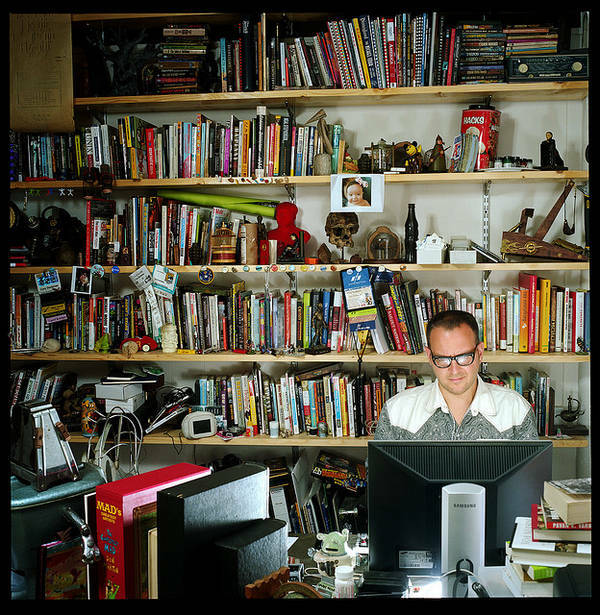 The other issue for me with this image in particular is before I even began to play along with Denise’s lesson, I thought “hey, that’s Cory Doctorow.” Maybe that’s just me, but that’s one of the potential problems with these kind of exercises. But interestingly, that’s about it as far as a discussion of “visual rhetoric” goes. The rest of the video lectures for week four return to pretty traditional comp/rhet issues– images in scholarly articles, coming up with good titles, and introductions. I thought there’d be more on the visual rhetoric angle. I find the pacing terrible…long stretches of nothing followed by one-week turnarounds. Pacing is a good way of putting it. I guess I’m not in the “terrible” category, but I do think that one of the problems I see in the class is a fairly classic example of a class that was taken from a face to face setting and then “poured” into an online setting. So, by chance my wife is reading Homeland and I told her, “hey, that’s funny, I was just looking at a picture of Cory Doctorow on a freind’s blog that I’m reading,” which didn’t get that much of a response other than, “oh, Ok.” but tis morning I grabbed the pictu from here and showed here and said, so what is it that you like about Doctorow, and she said ” he seems to know about all these tings that are right in the zeitgeist,,” and so she started reading this colle section from page 71-73 in Homeland, which was all about Noisebrige hacker space 3d printers and Burning Man, all in a narrative. So I dug up another quote from page 192 about Noisespace and that was a nice overlap of serendipity. Now I have a sense of who Doctorow is as a writer … And, yes, now I get it why this photo is not only about expertise in the actual stuff that is in the picture (without knowing that it’s Cory Doctorow) but I also get why the picture was chosen since (now knowing about Cory Doctorow) these quotes from Homeland are all about expertise … Modern hackers pace expertise and detail. She read me the section about discovering how a 3d printer could turn sand into glass, etc. this link is about hacking into the aver space at NoiseBridge. Next PostNext An idea for a CCCCs panel: How about the teachers amongst us who have been MOOC students?